During my second semester of my second year in Vernon Malone, I was nervous to take art but at the same time I was excited for what laid ahead. What got me through this semester was having an open mind and knowing that I shouldn’t get discouraged for any “mistakes” that would occur. I was amazed with how many techniques I learned throughout this class with a relatively little amount of days and how if you let your imagination run wild, then you can come up with some magnificent ideas. One project that I felt I was the most successful at was my first official art piece with the pastel background and India ink painted girl and tree. For it being my first time doing anything artsy since elementary school, I feel that I exceeded in proving myself that I did have potential. 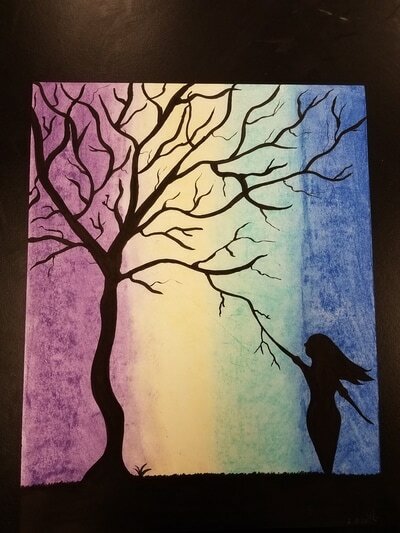 At first I was nervous in what to make when choosing what to do because I never really thought about using my imagination to make art but with some help and inspiration from friends, likes, and Pinterest I was able to come up with a simple yet meaningful sketch that I would soon develop into a colorful art piece. I had learned to enjoy using the soft pastels and but was quite uneasy at the beginning with using the deep black ink. So without further to do, with a slow hand I surprisingly made a good looking silhouette. Once I saw my piece hung up for many to see, I felt proud with what I had created and that was what initially opened the door to more creativity for me. 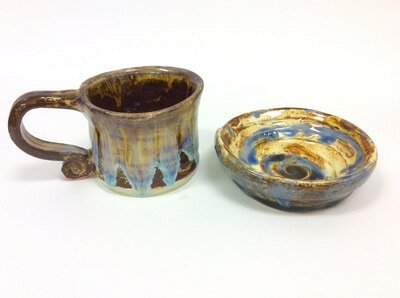 One of my projects that I felt that I had to overcome many obstacles was when I made my mug and bowl set! Good gracious I struggled with those two pieced of clay! I was very new with the throwing on the wheel thing and had not yet learned all the techniques to make them better. Though I enjoyed it a great amount, the struggle was for real but with a lot of persistence I was able to overcome many obstacles. I had a lot of trouble getting things centered, having clay that was too hard to work with, making the sides too thin on one side and think on the other. I had to keep trying out different techniques and learn from videos or just trial and error until I saw at the perfect moment something would come out and I wouldn’t mess with it anymore. That is basically how I came out with my mug and bowl. The glazing was super easy so all I have to say is that I’m really happy with how they turned out. I enjoyed working with water colors a lot and clay. I started liking watercolors by a mere coincidence. I was able to do a few projects with it and play around with them, I even went and bought some at Michael's because I liked it so much. Another medium that I really enjoyed was the pottery clay. Even though there was a struggle with it, the final products of what I made looked really cool to the point that I want to go take classes or something so I can keep on making stuff. In retrospect, I'm really glad that I was able to learn stuff about art. Art has taught me a lot of different things from knowing how to center a mug, to having patience in every art piece. I already signed up for Art II I believe, so I'm excited for what other challenges and opportunities I'll have in the future. 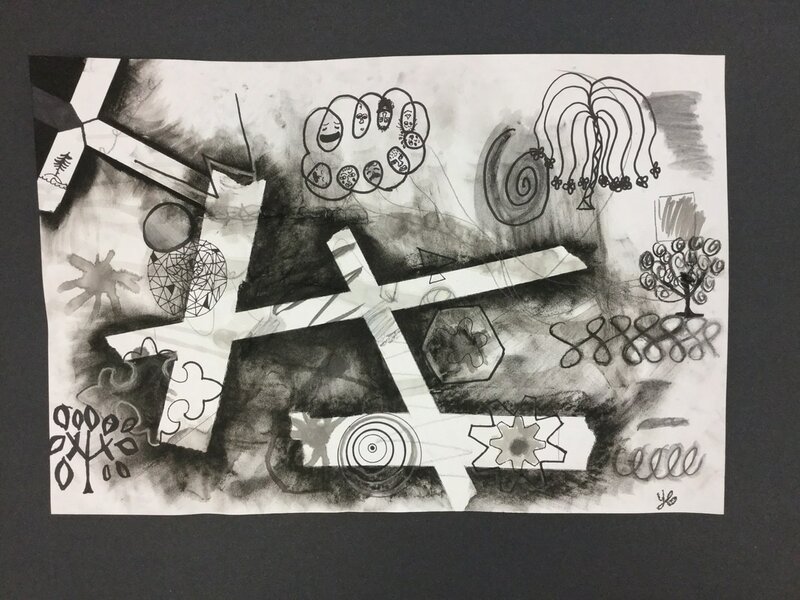 Describe: This art piece is watercolors, India ink, and tape with ink on it. The subject matter of it is to encourage people and let them find comfort in the quote that helps people make better decisions. The title of this piece is "Honorable Wisdom" and here you can clearly see the type of technique I used for the setting. 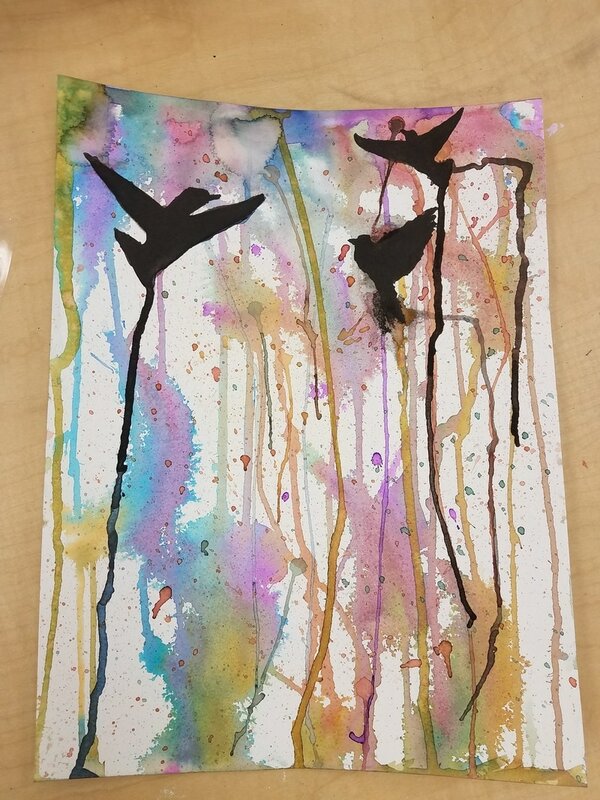 Create: This piece is made of watercolor on thick paper with the birds made of India ink and the lettering from a technique that I just learned where you put tape on top of words and then drench it with water and peel of the water so that only the words are left. Big Idea: I was inspired by the show Sherlock...hence the quote and I also like quotes that promote you to make good decisions. Goals: As a goal I want for people to feel moved by the art work and capture the moment. I think this piece does go deep to people and touches their hearts. Thoughts: Well I had very title time to work on this project so I learned that it's best to have more time to prepare. So there wasn't much time to envision what I wanted but I'm glad with with came out. 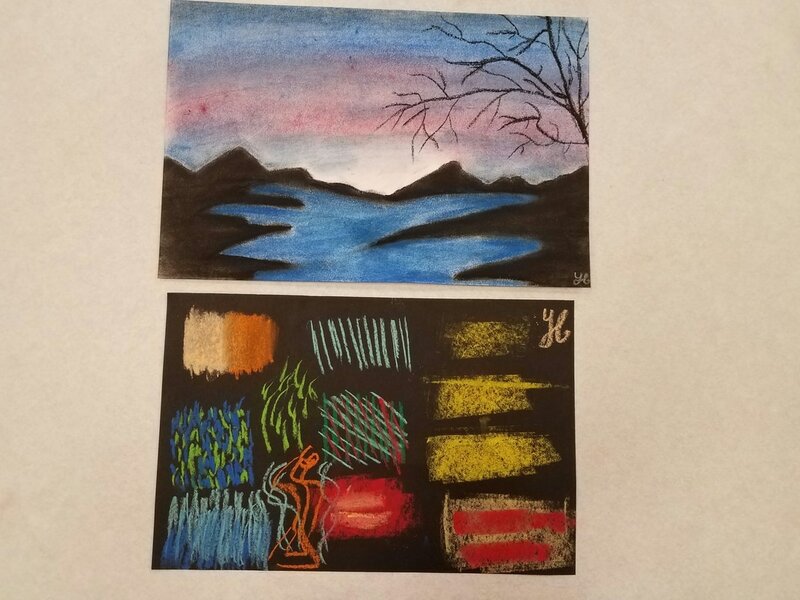 ​Describe: My art has a beginner, learning look to it (which makes sense considering this is only the second time I work with throwing on the wheel) and I am really enjoying it. The subject matter is to have functional ceramics that I would be able to use for my own daily pleasure. Create: I made my mug and plate from white ceramics that were thrown one the wheel. 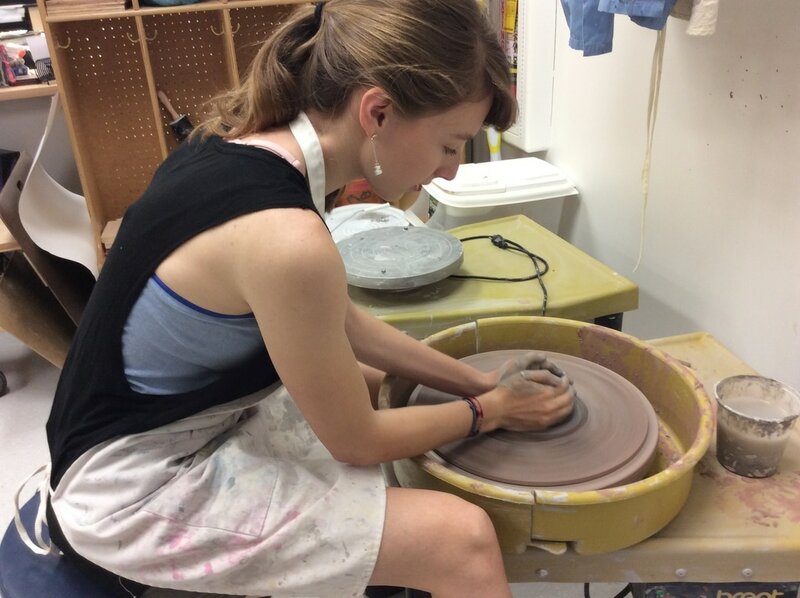 I had to use different tools while throwing on the wheel, like a needle tool, a sponge, and the wooden thingy. Big Idea: I was actually inspired by Lauryn and my brother. I saw them doing cool stuff with clay and seeing how useful they were, so I was enticed to try it out. 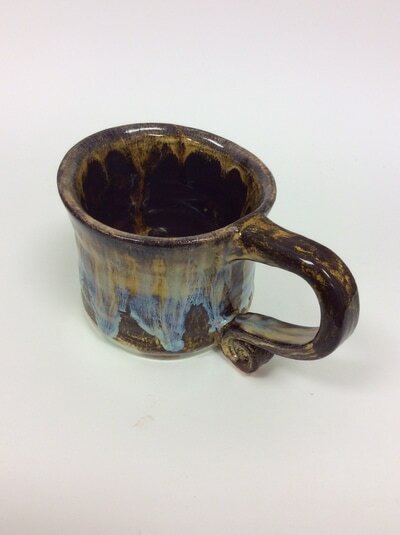 The color I glazed the mug was to represent the rustic style I like and reminds me of when I used to live in Arizona. Goals: As an artist I’d like to show my hard work in my piece and the beauty in the simplicity. With this project I was able to accomplish my goal of making simple functional ceramics that display found memories of my past. Thoughts: I learned many things while making this project such as knowing how to make a centered bowl or mug, also figuring out different ways to make your glazing creative. Not everything came out as I thought it would but I’m glad that it all worked out because it turned out cool. 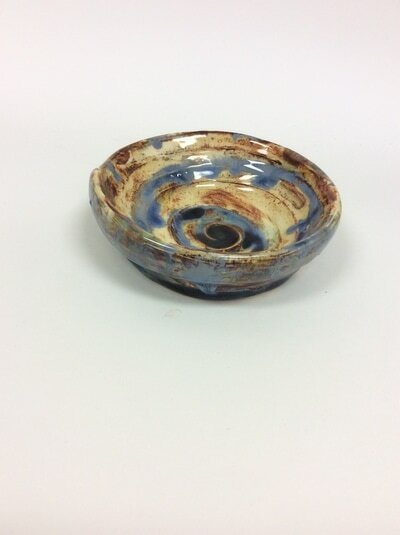 I think in the future I’ll be doing more ceramics for my personal use or even to sell. ​Describe: I made a little backpack made out of denim and an old tank top. The subject matter would be to make a functional piece that I could use later on. I initially was going to make a bag and call it my "Sherlock Satchel" but I'm not so sure what I should call it now...nothing sounds cool. 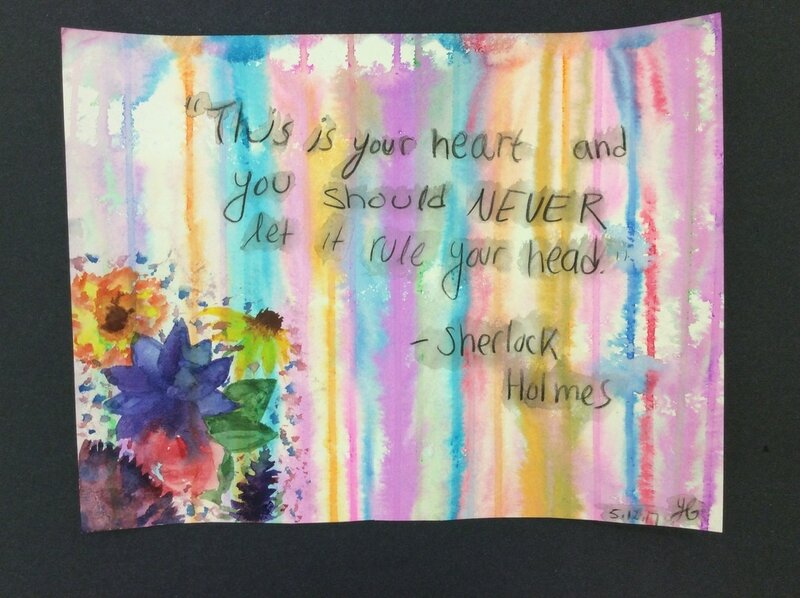 In this "art piece" you can clearly see that I like Sherlock Holmes and jeans with a vintage style. 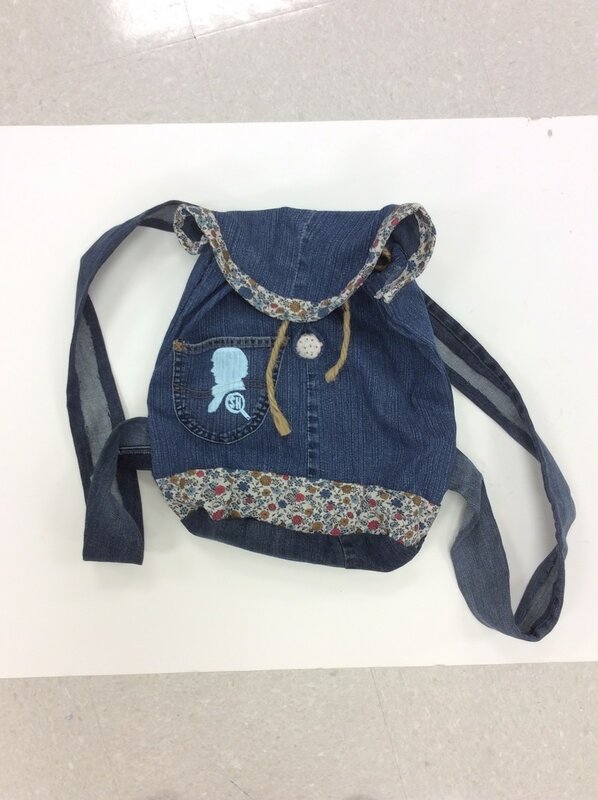 Create: The only media I used in this project was denim, cloth, and fabric glue, with melting Sherlock’s face onto the denim. I basically just used the fabric glue to hold everything together and heat to melt the silhouette. Big Idea: I had been really wanting to make my own functional piece for a while now, and I love jeans and the style of it, as well as Sherlock. In my work I try to show the devotion and hard work to show people how much I enjoyed making this piece. Goals: I planned on making this bag so that could be durable and last me a while. If anything happens to it then I definitely will try to fix it and keep it all together. I also had a goal at making something useful for myself which I finally got to accomplish that! Thoughts: I learned quite a full stuff during this project, I learned that you need to have a goal ahead of time of what you want or it won’t come out the way you want it to. Also, always be attentive on what you are doing and make sure that there isn’t a step you are missing to do. Although I wasn’t so sure how it would all turn out, I am satisfied with my “Sherlock Satchel”. Now I know how to use cloth and fabric material in my art which would help me make more handy things. Describe: My art is a clay piece, and it is named ...... 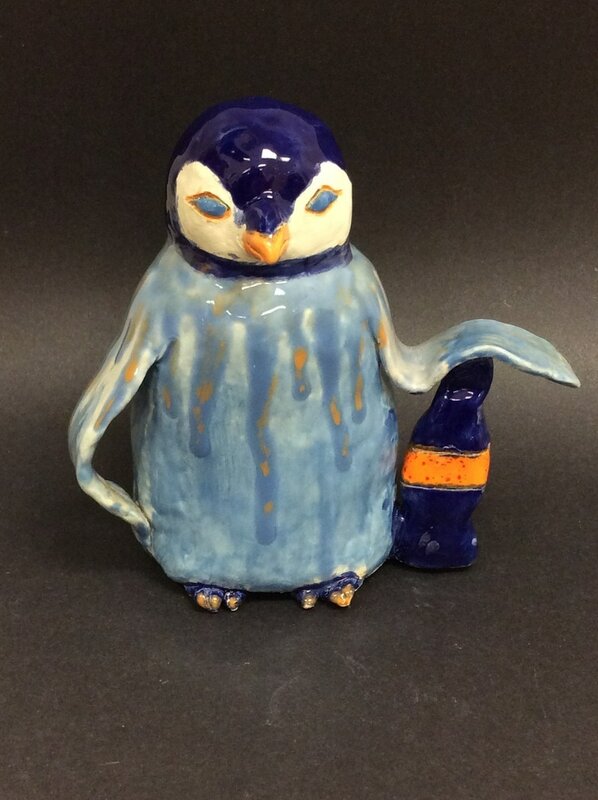 The penguin is obviously made out of white clay and glaze. The subject was to make a realistic detailed animal but i decided to add some humor in it as well. Create: I used clay to build my sculpture and many tools alongside to carve out details and work with the clay. Such as a roller to make the clay a certain thickness and clay utensils to cut my pieces and all. Sometimes I had to soften the clay or water it a bit to keep it moist. Big Idea: I was inspired by the cuteness that I saw on the internet and I wanted to make something on the easier side. I wanted to show some humor in my art by adding the Coke bottle. Goals: I did accomplish a goals of working with clay and creating a sculpture. Now I have more experience with different mediums in art. Thoughts: I learned that with clay you need to have patience and effort in your work. While making my other pieces I'll now know different ways to making something. Describe: My art is a stenciled piece with spray paint. What I wanted to convey was a simple demonstration of a childhood memory, even though not many people know who The Little Prince is. The title of this painting is called My Little Prince and I think that the spray paint is quite clear and the stenciled makes it have a neat organized look. Create: As mentioned before, this is just spray paint. To create this final piece I had to find a picture of the Little Prince and then make to just black and white, to get the negative and positive contrasts. After printing that I traced around him to get him onto the paper and with an exact-o knife I cut out the negative colors, then I put the stenciled piece on top of my final paper and spray painted, that's it. Big Idea: Well at first I had no idea of that i wanted to do, then I thought i was going to do squidward but then decided to do the Little Prince because on Pinterest there were some cool ideas about him and I really like him. Goals: For right now I only have the goal to experience a variety of different art medias, and find out what is best suited for me. 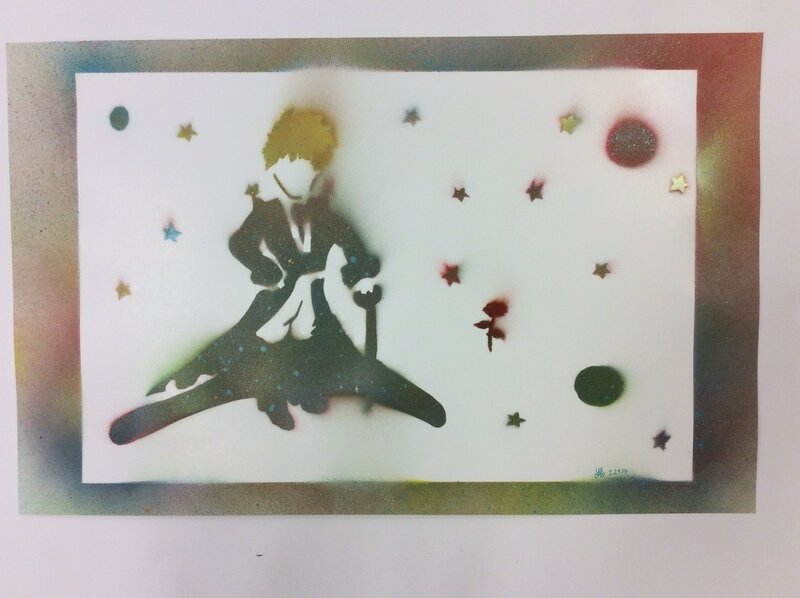 Thoughts: In my project I learned how to use spray paint and how to stencil. Even though this isn't totally what I envisioned, I am surprised how it came out. In future art pieces I will now know how to make things better. Describe: I think my artwork looks at a beginner's state. Since this is my first time having to do an art piece, I didn’t really have a meaning or subject for it. I think the ink for the silhouette was the main part of this piece. Create: For the background I used soft pastels and India Ink for the silhouette. With the soft pastels I tried to blend the colors correctly so that they could bled into each other. And for the silhouette I used Aqua Flo brushes for the basic drawing and a quill pen for finer detail. Big Idea: What inspired me to do this is a picture I saw on pinterest and liking how you don’t have to put so much detail in the silhouettes. Plus I like how deep black looks as a contrast with other colors. I did make it so that the girl would as though she was a part of the tree, but it’s all up to your interpretation. Goals: I guess I would say that I have a goal to find out what I am best at and then head in that direction to enhance my skills in that area. This piece did help me to see that I enjoy pastels and would like to do more with them. 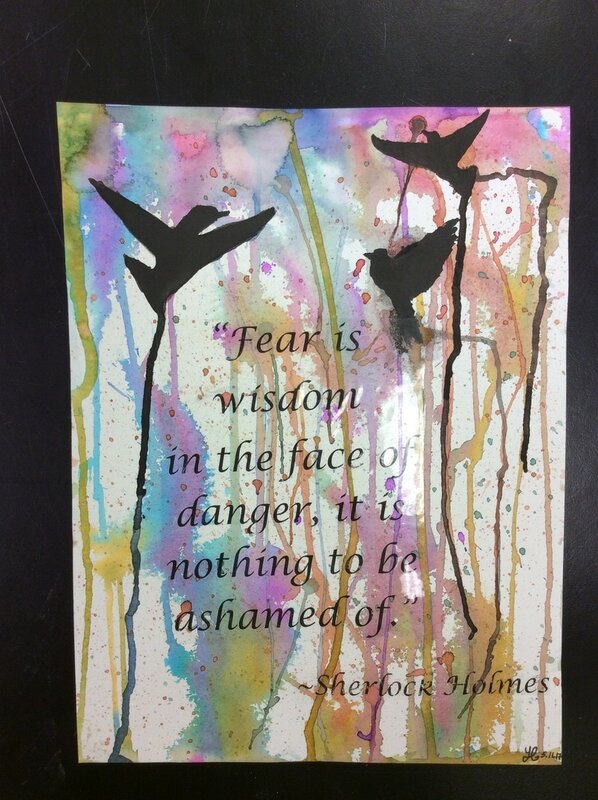 Also I am less scared to use ink (and mess up), and be more creative. My Thoughts: I’ve learned that when blending colors, it’s good to make sure that they all merge and flow nicely. My final piece actually turned out better than I thought, which I’m very surprised by. As mentioned before, I was scared to messing up with the ink, especially on the girl’s silhouette. Doing this piece helps me to see what I can do better in the future, and shows me that I am capable of not messing up with ink (which I enjoyed working with). This is my first time doing art...so don't expect much. 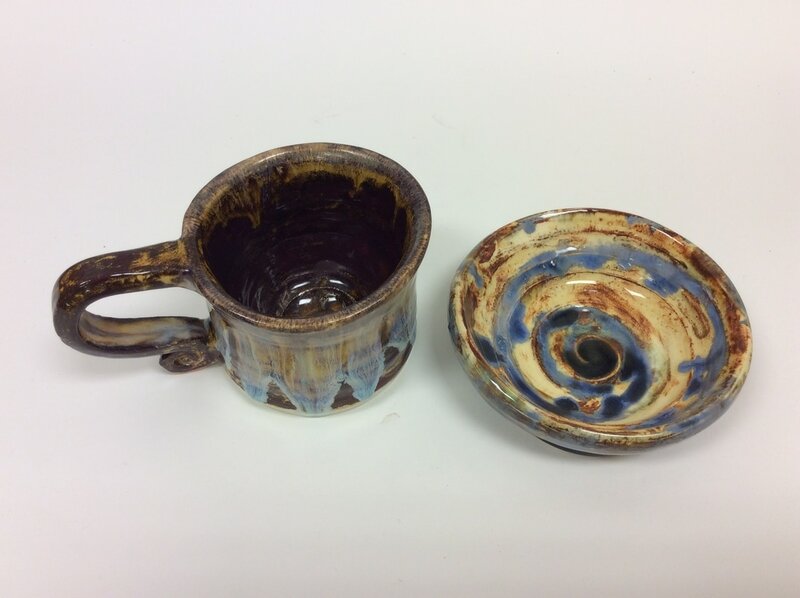 I like using watercolors and making functional pottery. Being persistent and creating something with meaning is what I like to achieve.